Dr Darren Hutchinson, a Consultant Fetal and Paediatric Cardiologist, has been appointed the Head of Australia's first dedicated Fetal Cardiology Unit based at the the Royal Women’s Hospital (the Women’s). 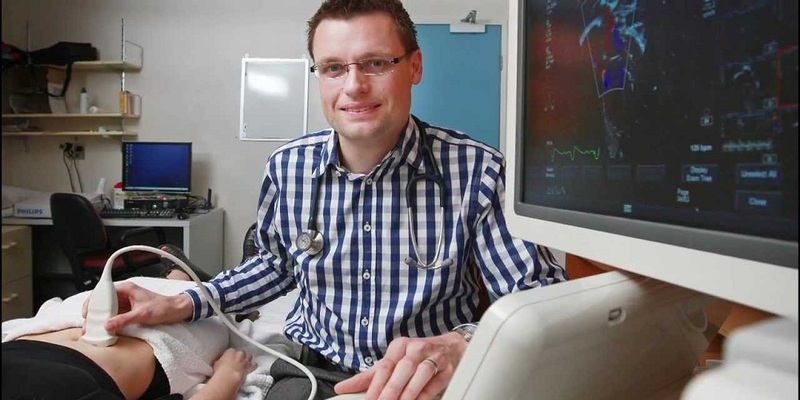 Darren is one of the few Paediatric Cardiologists in Australia trained in performing detailed Fetal Echocardiography on women throughout pregnancy as well as providing detailed counselling of complex fetal cardiac conditions once diagnosed. He said the Unit would provide care to women from Victoria as well certain complex cardiac patients needing early cardiac surgery from Tasmania, South Australia, Western Australia and The Northern Territory. “Approximately 3,000 babies are born each year in Australia with congenital heart disease, placing a great burden on parents and their child,” Dr Hutchinson said, with “congenital heart disease accounting for up to 20 per cent of neonatal deaths. Dr Hutchinson said the new unit would be closely integrated into the larger multidisciplinary Fetal Medicine Unit led by Dr Elske Posma and Women’s Ultrasound Department led by A/Prof Ricardo Palma-Dias. “The new Fetal Cardiology Unit at the Women’s will provide Victorian women with access to the accurate and timely diagnosis of fetal congenital heart defects using state-of-the art ultrasound equipment in a calm and family centred environment,” Dr Hutchinson said. Dr Hutchinson trained in Melbourne and obtained speciality Fellowships in both Paediatric Cardiology and Paediatric Cardiac Imaging at the Royal Children’s Hospital followed by a Clinical and Research Fellowship in Fetal Cardiology at Stollery Children’s Hospital in Alberta, Canada under world leading Fetal Cardiologist A/Prof Lisa Hornberger. This international Fellowship was supported by both the Federal and State Governments, with Dr Hutchinson being awarded both the prestigious Victoria Fellowship and the Endeavour Award in 2012. Dr Hutchinson has appointments at the Women’s, the Royal Children’s Hospital and Western Health in both Fetal and Paediatric Cardiology. Darren’s research interests include functional and anatomical assessment of the fetal heart, improving prenatal diagnosis and counselling of congenital heart disease and first trimester fetal echocardiography. He has written and co-authored a number of articles in the area of Fetal Cardiology as well as co-authoring textbook chapters. Along with Dr Bryn Jones (Paediatric Cardiologist) Darren will provide an invaluable link to the Paediatric Cardiology and Paediatric Cardiac Surgical Services at the Royal Children’s Hospital. He said the newly formed Fetal Cardiology Unit additionally aimed to provide structured education in Fetal Cardiology and Fetal Echocardiography to obstetric trainees and other sub specialists based at the Women’s.